This week brought a request from our daughter for an 'activity pillow' to help our granddaughter develop her fine motor skills. 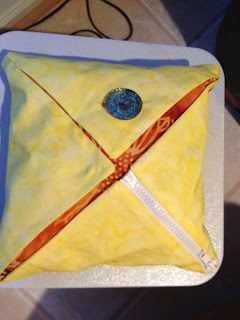 After listening to daughter's explanation of the purpose for the pillow, I decided that I could make one pretty easily and it would be a lot simpler (and cheaper) than the 'activity' books that I could find on the web with the same skill-building purpose in mind. 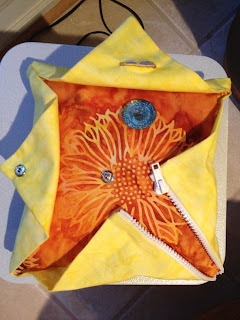 I quickly came up with a design that would allow granddaughter to practice using a button, a snap, and a zipper. Everything but the 'separating' zipper and snap came from my stash. 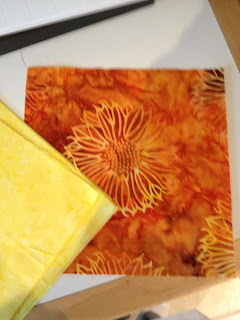 I started with some bright colors for a pillow and some flaps. Then it was a simple matter to hem the flaps adding the zipper along two seams, make a buttonhole on one flap, sew a snap on the other, and finally sew it all together and stuff. Since Judith Catherine loves to study objects in detail, I think she will enjoy it quite a bit, while getting in some valuable practice that will come in handy in eventually dressing herself! What a great idea! And it's very pretty and functional too. Lovely that she will open it to discover a bright flower, too. The pillow is a great idea...years ago made a cloth book with pages of the same varied skill development activities for my nephews.